EarPlanes flying ear plugs are recommended for adults and children as young as one year old (be careful with children under 3 as these can be a choking hazard). 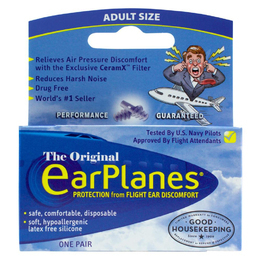 EarPlanes are designed to be used on one round-trip flight. Just put them in before takeoff, remove them when you get to the maximum flying altitude (if you like you can just leave them in throughout the flight) and put them back in about an hour before landing, for a comfortable, pain-free flight. EarPlanes work by regulating the rate at which air moves into and out of the outer ear, giving your inner ear time to compensate for changes in pressure that cause the ear blocking and pain experienced by many people. EarPlanes are great for driving through mountains as well. EarPlanes have an NRR of 20, which allows you to hear normal speech but takes the "edge" off background noise that can be really annoying on airplanes. With EarPlanes in, you can concentrate better, read or even fall asleep, and wake without the blocked ears you may have experienced in the past. Now Available: Disney Planes EarPlanes Especially for Kids - go here. Cirrus EarPlanes Ear Plugs for Flying (NRR 20)5John KJuly 19, 2013I have used this plugs in the past and they work very well. I had ordered the same ones from this site because the Price is right, the service was fantastic and the delivery was also good. Cirrus EarPlanes Ear Plugs for Flying (NRR 20)5ChristineNovember 25, 2012These child size ones work a treat for this adult with small ear canals. No more pain when I fly! If the adult size does not work and is hard to filt, give these atry. Cirrus EarPlanes Ear Plugs for Flying (NRR 20)5JanetJuly 30, 2012Easy to use and I could hear just fine upon landing. Cirrus EarPlanes Ear Plugs for Flying (NRR 20)5JoeApril 5, 2011Worked fine...clear ears when landing.